As readers of this blog know, I have long regarded the return of economic crisis as an inevitability (because the core energy and no-growth predicament facing the Western world wasn’t solved in 2008-9 but merely kicked further down the road by increasing debt and printing money). It looks like 2012 will be the crunch year, as a series of inter-related crises are rapidly converging: (1) The European sovereign debt crisis; (2) The continuation of the chronic US inability to balance its books, and of instability in the Middle East; (3) The probable onset of serious declines in global oil production, as new oil megaprojects are no longer able to compensate for accelerating decline from existing fields; (4) heightened risks of a war with Iran, as the narrow window opens between the start of US delivery of the next-generation bunker buster MOP (from November 2011) and the culmination of the Iranian nuclear weapons program and its hardening against air strikes (next year or two). The European debt crisis dominates headlines, with the Anglo-Saxon media crowing about the lazy, shiftless Meds (as opposed to the diligent and careful Germans) and blaming socialism for their problems. This of course has a number of flaws within it. Greeks work the most hours in the EU – 2000 per year, relative to 1300 in Germany. And the only major EU nations without huge debt and fiscal problems are the Scandinavians, who are about as “socialist” as one gets nowadays. But this is all sidestepping the fact that debt and fiscal crisis afflict the entire Western world, and it is just that – due to the special political weaknesses of the Eurozone – have manifested first and foremost in Greece, Italy, and Spain. However, a look at the actual statistics reveals that even the “serious” countries are in a great deal of trouble. For instance, in 2010 both the US and Britain had bigger primary deficits (cyclically adjusted) than “basketcase” Greece, whereas Italy’s was actually positive! 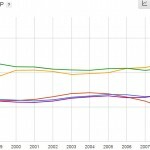 The Meds’ total net government debt is larger, but on the other hand, if even France is beginning to experience perturbations – a country whose fiscal balances are better in every way than Britain’s or America’s – then it surely cannot be long before the crows come home to roost in the Anglo-Saxon world. Below are two tables that would be very informative for discussions about the crisis, as they overturn many of the lazy myths and tropes populating the discourse. Though the US position looks salvageable because of the positive GDP growth less cost of finance indicator (suggesting that its ability to pay back its debts are growing faster than the debts themselves), I am not convinced of the reliability of that indicator. First, it assumes fast growth – growth that has yet to materialize despite massive fiscal and monetary stimulus since 2008. Second, it assumes that interest rates on Treasuries will remain low – but that assumes a US that is becoming rapidly indebted and making signals it is going to inflate it away remains an investor safe heaven. It shows zero ability to make a credible commitment to eliminating the budget deficit, which is only going to be compounded as the baby boomers start retiring. This chart from Michael Pollaro shows that in some respects the US position is actually worse than those of the PIGS in aggregate. For every $60 it received in revenue, it spends $100, and it would take almost 6 years for the US to repay its debt if the entire budget was devoted to it. In contrast, the average PIGS figure is $78 in revenue for every $100 in spending, and it would take them only 2 years of their combined budgets to repay their debts. The position of Britain is very weak. It’s economy, and especially its budget, is highly reliant on the City of London. The tanking of the financial system has resulted in zero growth (GDP is still about 5% below peak 2007 levels) and chronically high budget deficits at around 10% of GDP, and the prospect of a second recession with pull the figures even further into the red. Nor has a weaker pound stimulated an export based recovery. Britain’s big trump card is that its bonds have very high average numbers of years to maturity, so refinancing will be easier even if its rates were to suddenly lurch upwards. Now its still over-extended and will probably go bankrupt within this decade, but probably later than the Meds or even the US. Germany has a strong position, with only a modest budget deficit and reasonable levels of debt. Overall, it is net global creditor, with a net international investment position of 37% of GDP. But this presents another problem. Quite a lot of that is in the forms of loans to and assets held by its banks in the stricken Med region. A meltdown there would send the value of these assets plummeting, necessitating massive bailouts that could in turn threaten even Germany’s solvency. Hence, a possible reason for the recent poor sales of German government bonds. Despite chronic budget deficits and an astronomic public debt of 220% of GDP, I actually think that Japan may be the country in the least danger in the medium-term future. 95% of its government debt is domestic, largely to Japanese corporations, which lend to the government for social spending in exchange for the understanding that tax rates will be held low. But those same banks and corporations are flush with cash: Japan’s net international investment position is an impressive 56% of GDP. In a way, it’s just a different method of financing a welfare state. It’s still probably unsustainable – domestic investors too may dry up, especially as the Japanese population continues to age and begins to spend rather than save – but I’d wager less so than the US or most of Europe. Fiscally secure nations include China, Latin America, Scandinavia, and Russia. China has problems with various non-performing loans and municipal over-indebtedness, granted, but these weaknesses are largely mitigated by its phenomenal growth rate and a net international investment position of 36% of GDP. Latin America and Scandinavia tend to have responsible fiscal management and adequate growth rates. Russia has globally low levels of government debt, its citizens likewise have low debt levels (a feature more of its underdeveloped credit system, granted), and an international net investment position of 17% of GDP. Though the budget deficit is currently balanced thanks to high oil prices, a significant drop can take them into the red very quickly and deeply; however, this is NOT a problem because it is a near certainty that on average oil prices in the next decade will remain high and rise further. 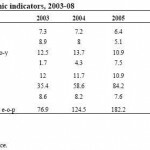 What IS a problem is that Russia is a “high-beta” economy, highly affected by developments elsewhere – in 2008, its recession was deeper than in any major Western economy (though compared to them it also had the strongest recovery). The primary reason was the sharp cut-off in Western credit to Russian banks and corporations, resulting in multiple refinancing crises. Today, this problem is less acute, with the Russian banks and corporations having learnt that such dependence may be a problem – nonetheless, a huge sovereign debt crisis in the West can still give Russia a very sharp knock in the short-term. This brings us to another side of the issue: peak oil. Oil reserves are depleting, and global production – after being on a plateau from 2005 to today – will probably begin to consistently fall from 2012 as oil megaprojects sharply fall off. Furthermore, a war with Iran, and its possible capability to blockade the Strait of Hormuz for some time, may cause an extremely disruptive spike in world oil prices, as 25% of world oil supplies transit through the Persian Gulf. On the other hand, China is right now entering the mass automobile age, with the numbers of cars sold per year overtaking the US in 2010. So we will see a rise in demand from China and other emerging markets. But this is not all. As discussed on other posts in the blog, e.g. here, here, economic growth in general is crucially dependent on net energy availability and the efficiency with which it is converted into useful work. Both indicators have slowed to a crawl, and quite soon the former may well go into reverse. Furthermore, the reality of open global markets with limited global energy supplies means that countries will be more and more competitively bidding for the high-EROEI energy sources that remain (primarily, oil). The US in particular is highly dependent on oil to power its service-based economy, but it simply cannot afford oil to the same degree as can China (see this excellent Oil Drum post A Brief Economic Explanation of Peak Oil for an explanation). This means that the economic pie is now limited, and growth in one place (above all, China) is now to the detriment of growth in other already high-income places (the US, and the less efficient parts of Europe). For a limited time, this issue can be bypassed by the accumulation of debt in the high-income countries – much of which, it should be noted, is loaned out from China and the oil exporters. But poor countries lending to maintain rich country living standards is bizarre at face value, and it is unsustainable in the long-run. How to survive the coming storm? From the investment perspective: Keep assets in US dollars, but only those that can be sold off at relatively short notice. Though dangerous in the short-term, China, Russia, and some countries in Eastern Europe are very good long-term plays. In particular, buying in at the depths of crisis can pay huge dividends in the future. A good bet right now: property in Bulgaria and Minsk. Natural resources are another excellent long-term play (including gold – a good bet in a time of instability). However, it is probably not a good time to buy in right now, as there is the risk of a sharp (but short) fall once the economic deterioration gathers critical pace. If you have the means to be an independent financial speculator, try out US CDS. The US will probably never formally default – controlling its own currency, at the most, it will do so via inflation – however, the perceived risk of default WILL be reflected in those instruments. Don’t bet the farm on it, as they’re high risk, but do consider setting aside 10% of your investment poll into this or similar instruments, as the returns have the potential to be mindbogglingly high. The other two BRIC’s, India and Brazil, I am not so certain of because their low human capital precludes very fast growth. In terms of specific sectors in the long-term, probably the best bets are IT and medicine because the entire world is aging, and when people are unemployed, they will spend their time on Facebook and playing video games. Perhaps I’ll have another post on the other aspects of how to keep afloat in the coming era of turbulence. Keep an eye out for it. Reread S/O posts about the return of geopolitics to Europe and my decade forecast and piece on future superpowers, and continue reading this blog as it is ahead of so many issues well before they started becoming conventional wisdom.